The city by the sea has a long history, from the American Revolution to the America’s Cup. Newport’s most famous attractions though are the mansions built by some of America’s wealthiest people. This walk visits most of the mansions and includes a section of the famed Cliff Walk. The walk itself takes about two and a half hours at a very leisurely pace (not including visits to the mansions). Starting from the parking lot for The Breakers at the corner of Ochre Point Avenue and Victoria Avenue, head south on Ochre Point Avenue and the left onto Ruggles Avenue toward the sea. Along the way you will be following the tall wrought iron fence with limestone pillars that borders of one of the most famed mansions. When you reach the end of the road turn left onto the Cliff Walk. To your right is the ocean and on your left is the large lawn and back of The Breakers. This mansion, built in 1895, was owned by Cornelius Vanderbilt II, and today is the most visited site in Rhode Island. 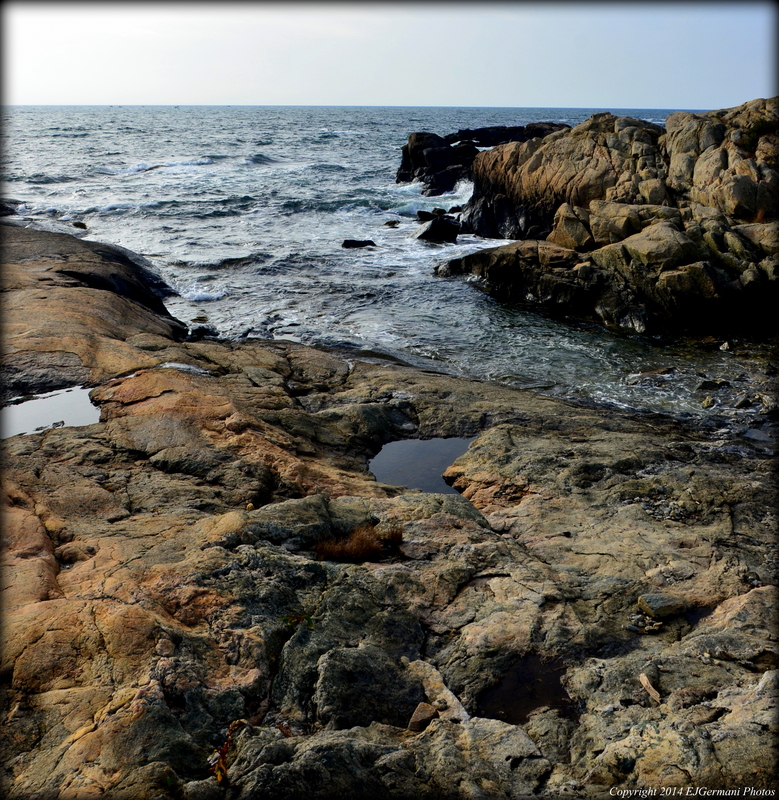 Continuing along the Cliff Walk you soon come upon Salve Regina University. Here is another large mansion, being Ochre Court. This is the second largest mansion in Newport (after the Breakers) and was built in 1892. Continuing to Narragansett Avenue you will come to the famed Forty Steps. Here you get a unique opportunity to make your way below the Cliff Walk to the rocky shoreline below. The steps and rocks tend to be wet so be sure to exercise extreme caution here. After climbing up the steps you will then leave the Cliff Walk and head west on Narragansett Avenue to the famed Bellevue Avenue. There are several private residences along this stretch that are quite impressive. Along the way and on the right is Chepstow. This mansion was built in 1860 and set back off of Narragansett Avenue. The mansion is actually quite difficult to see from the road as its gardens and trees hide it from view. In mid July the hydrangeas are quite impressive. Ahead on the left at the intersection of Bellevue Avenue is a large stone house. This is the Osgood-Pell House, built in 1887, and is home to the Preservation Society of Newport County. Continuing, turn right onto Bellevue Avenue, you will next pass the White Lodge Condominiums on the right before coming to The Elms on the left. This mansion, built in 1901, is quite close to the street and has large wrought iron gates. Behind the mansion is a large lawn and gardens. There are a couple more smaller mansions to the north along Bellevue Avenue, most notably Kingscote and the Isaac Bell House. For this walk, however, reverse your direction and start heading south on Bellevue Avenue passing Narragansett Avenue. In a few blocks you will come to the Chateau-sur-Mer. This mansion, built in 1852 of Fall River granite, ushered in Newport’s gilded age. Continuing along Bellevue Avenue you will pass Vernon Court, the Illustration Museum and its clock before coming to Rosecliff. This mansion, built in 1902, is set back off the road and has a large sprawling lawn in front of it. In the right light you can see through the large windows of the mansion and see the ocean behind it. The ballroom at Rosecliff has been featured in several films including The Great Gatsby, True Lies, and Amistad. Continuing south you will pass the (formally Astors) Beechwood Mansion, currently being renovated, before coming to the Marble House. Built in 1892, and resembling the White House in Washington D.C., this was another of the Vanderbilt mansions. 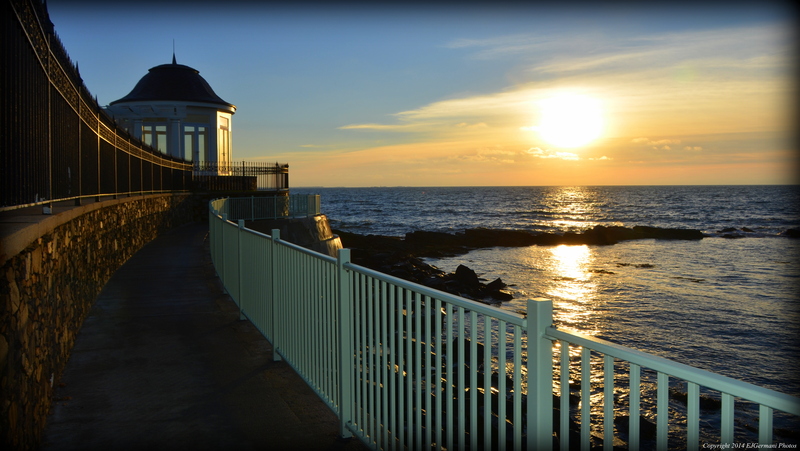 Behind the mansion (and viewed best from the Cliff Walk) is the famed Chinese Tea House. From the Marble House turn around and follow Bellevue Avenue to the north retracing your steps for a few blocks. You will be looking for a one way sign at Marine Avenue. There is no actual street sign for this street so be sure not to miss it. The street looks like a driveway. Turn here and follow the street to the east as it narrows to almost just a cart path. Ahead and beyond the gate is the Cliff Walk once again. Take a look to your right and notice the Tea House in the distance. For this walk turn left and follow the Cliff Walk over the “sea wall” and then around the bend at Anglesea. A ramp then brings you up to the end of Ruggles Avenue. Turn left, then right onto Ochre Point Avenue to the parking lot for the Breakers. This walk could take almost literally all day if you choose to actually tour the mansions. 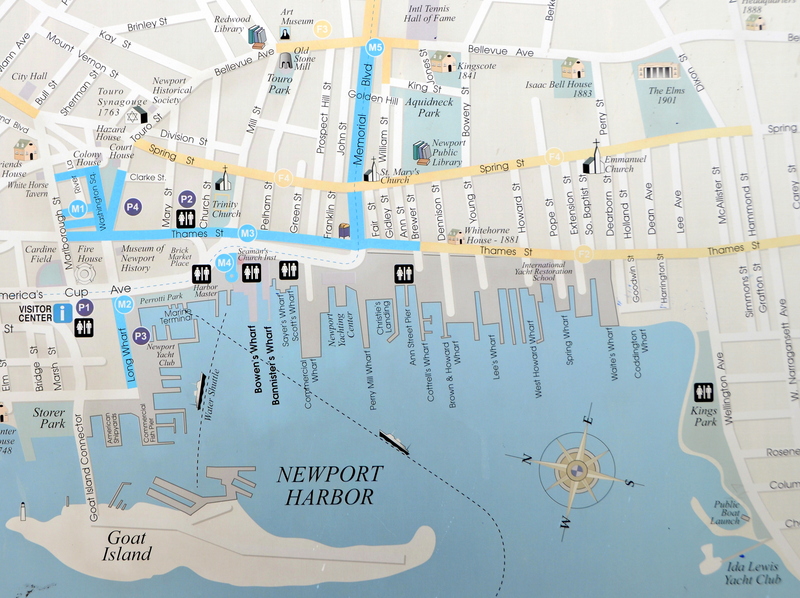 Trail map can be found at: Newport Mansions. First section is easy and mostly paved, last part moderate to difficult. The Cliff Walk is easily one of the most visited “trails” in Rhode Island. It is one of Newport’s premier tourist attractions with sweeping views of the Atlantic Ocean on one side and some of the nations most famous mansions on the other. The first part of the walk is the most heavily traveled as it is paved and suitable for most people. The later parts of it, you will find yourself scrambling over rocks along the shore. I started this walk from Memorial Boulevard just west of Eastons Beach. The paved path first meanders along the cliff above Easton Cove. In the distance you can see the Sakonnet Point Lighthouse as well as Sachuest Point. I soon came to Forty Steps. The steps lead down toward the water for a view from below the cliff. On days with high waves and sometimes at high tide you may get a little wet. Continuing on, I made my way through the Salve Regina University properties. Here I came across several sections of fence with padlocks on them. A closer look, I realized the meaning of them. A clever modern day way of expressing your feelings for loved ones. I also came across some very old and creative brickwork at one of the stairways. The craftsmanship of yesteryear is quite impressive. After passing the two large and magnificent university buildings, including Ochre Court, I made my way to The Breakers. Quite possibly the most famous of the mansions, The Breakers, with its limestone walls and red tile roof, was built in the 1890’s by the Vanderbilt family as a summer home. I then came to Ochre Point on the back of the Breakers property before making my way through the large wrought iron gates at Ruggles Avenue. The next section of the walk is along a concrete walk with a fence right along the water. Along this section, the walk juts out to a point featuring a round, predominantly glass structure. The view here is wonderful in all directions. At the one and a half mile mark I came across the first section that was not a walkway. For a few hundred feet I had to traverse over fairly flat stones. Beyond that the walk is a combination of flat rocks, dirt paths, and paved paths for the next three quarters of a mile or so. On this section you can get a glimpse of the Rosecliff mansion. Just after Rosecliff the walk goes to the right, up some stairs, and then around an ivy covered building on the left. This building, the only directly on this side of the walk, was built as an artist studio. The next landmark is the Chinese Tea House on the Marble House property. It is a replica of a Song Dynasty temple. The walk continues through a tunnel under the Tea House. At this point you are at the two-mile mark. The remainder of the walk becomes progressively more difficult. After passing through the tunnel the walk continues for a bit to a second a shorter tunnel at Sheep Point. The last “easy” section passes in front of the Miramar mansion. A plaque at the end of this section reads “Rough Terrain Ahead”. From this point to Ledge Road is moderate to difficult. It is advised not to do this section if the rocks are wet as they become very slippery. I decided to proceed slowly for two reasons. The first as to watch my step, and the other to stop and take in the views. The ocean views are breathtaking along this stretch. The walk continues pass Rough Point, the former summer home of Doris Duke, to a bridge over a chasm that waves crash into. Along this section, to Lands End, and pass Ledge Road the trail is marked with an occasional bronze disk imbedded into the rocky shoreline. At Lands End, an aptly named peninsula, you may be able to see Point Judith, Black Point, and Narragansett Pier if the weather is good. After making my way past Ledge Road the walk continues to its end at Baileys Beach. After reaching the end I turned around and retraced my steps. Trail maps and information can be found at: Cliff Walk. Easy with slight elevation. Some cobblestone sidewalks. For the most part, with some slight variation, following the route in Ken Webers “More Walks & Rambles in Rhode Island”, this walk covers a good chunk of some of Newport’s most visited sites. I parked on Thames Street near the Post Office. Currently parking at this location is non-metered from November 1st to April 30th with 3 hour parking Monday through Friday from 6PM to 9PM, Saturdays 1PM to 9PM, and Sundays from 9AM to 9PM. The rest of the time it is only 15 minute parking. I started the walk by walking north along Thames Street passing some interesting architecture of buildings such as the Kinsley, currently home of the Newport Blues Cafe. This stretch offers many eateries and souvenir shops. I then turned right at the pathway that leads to the Trinity Church that was built in 1726. Locals claim that George Washington had given a speech at this church in 1781. Other notable visitors of the church have been Queen Elizabeth II and Desmond Tutu. After passing the right side of the church I turned right onto Spring Street and then left onto Mill Street. The walk up Mill Street passes homes on the National Register Of Historic Places including the Corne House. I also came across a massive London Planetree which was marked with a plaque by the Newport Arboretum. I would notice several more trees along this walk with these plaques. At the top of Mill Street is one of Newport’s biggest mysteries. It is the Old Stone Mill in Touro Park. 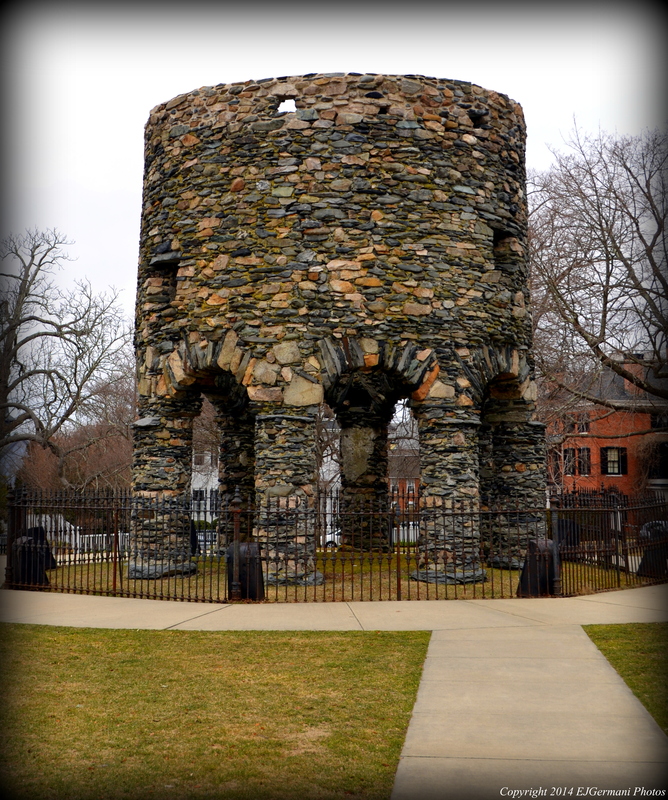 It is sometimes referred to as the Newport Tower. It is widely thought to be an old windmill but there is much debate to it’s construction date and furthermore of who built it. Some theories have it being built before Columbus reached America, possibly by the Norse, Templars, or Portuguese to name a few. After spending a little time here I then followed Bellevue Avenue in a northerly direction making my way pass the Hotel Viking before turning left down the narrow Touro Street. I then came to the backside of the District Courthouse, turned right on Farewell Street toward the side of the Colony House, turned left into Washington Square. The Colony House was built in the 1730’s and was once the State House. In July of 1776 the Declaration of Independence was read to the public here. I then continued down Washington Square and through the Long Wharf Walking Mall before reaching America’s Cup Avenue. The avenue is name after the famed yacht racing event that was held in Newport from 1930 to 1983. I then crossed the avenue and onto Long Wharf to take a peek at Newport Harbor. Most of the boats here at this time of year are settled in for the winter but in the summer months this is a bustling and very wealthy harbor with many yachts. I then continued my walk back to America’s Cup Avenue and started following it southerly towards Bowens Wharf and Bannisters Wharf. The two wharfs offer several restaurants and small shops. I then continued along America’s Cup Avenue to a sculpture simply known as The Wave. I then turned right onto Thames Street following it quite a distance pass several shops until I got to Wellington Avenue. Turning right onto Wellington I walked down the sidewalk pass a couple ball fields and into Kings Park. In the park there is a statue of Rochambeau, who was a French general that assisted the Americans during the American Revolution. There is a sweeping view of Newport from here as well as the Newport Bridge. I then retraced my steps back to Thames Street, crossing it and following the opposite sidewalk back towards Memorial Boulevard passing several more shops. I then turned right onto Memorial Boulevard and followed it uphill for one block until I got to St. Mary’s Church. This church built in the mid 1800’s was the location of the wedding of John F. Kennedy and Jacqueline Bouvier in 1953. I then crossed the boulevard and followed it back down Thames Street passing the Post Office back to the car. Scroll down to view a photo of a map that is outside the Visitors Center. I’ve been to Fort Adams many times and it is a very picturesque location. On a clear day you see the Beavertail and Rose Island lighthouses to name a few. The Newport Bridge, Newport Harbor, Fort Wetherill, and boats of all sorts are also visible from Fort Adams. The walk is marked by “Bay Walk” signs. The walk is about two miles long mostly on paved paths and service roads and follows the perimeter of the state park. Some of the highlights are the defensive fort itself, a monument to the U.S.S. Bennington, and the Eisenhower House. Construction of the massive stone fort started in 1824 and continued for nearly three decades. There were other fortifications on the property prior. Being the day before St. Patrick’s Day, the Irish flag was flying proud above the fort. Ironically, the fort was built mostly by Irish laborers. We (walked with the Appalachian Mountain Club – Narragansett Chapter) started the walk from the visitors center and followed the loop path counter clockwise. Fort Adams with the Irish Flag flying.